There are many different types of One Dimensional Barcodes. This tutorial will show you many of the 1D Barcode Formats and will help you understand the differences. A 1D barcode or One Dimensional Barcode is called this because of how the barcode is read. A 1D barcode is read from side to side. If have barcode numbers and you need help generating them, please go to this page – barcode graphics – or contact us by phone or email. The Code 39 specification defines 43 characters, consisting of uppercase letters (A through Z), numeric digits (0 through 9) and a number of special characters (-, ., $, /, +, %, and space). An additional character (denoted ‘*’) is used for both start and stop delimiters. In addition to 43 characters, Code 93 defines 5 special characters (including a start/stop character), which can be combined with other characters to unambiguously represent all 128 ASCII characters. An EAN-13 barcode (originally European Article Number, but now renamed International Article Number) is a 13 digit (12 data and 1 check-digit) barcoding standard which is a superset of the original 12-digit Universal Product Code (UPC) system developed in the United States. The EAN-13 barcode is defined by the standards organization GS1. This is a variant of the EAN barcode. This can be used for magazines where the last two numbers represent the volume or month of issue. From wikipedia: An EAN-8 is a barcode and is derived from the longer European Article Number (EAN-13) code. It was introduced for use on small packages where an EAN-13 barcode would be too large; for example on cigarettes, pencils (though it is rarely used for pencils), and chewing gum packets. EAN-8 barcodes may be used to encode GTIN-8s which are another set of product identifiers from the GS1 System. It begins with a 2- or 3-digit GS1 prefix (which is assigned to each national GS1 authority) 5- or 4-digit item reference element depending on the length of the GS1 prefix), and a checksum digit. 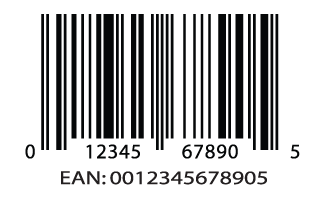 An ISBN barcode uses an EAN symbology. ISBN with 5 digit Add On. Most ISBN graphics also include a 5 digit add on. The first barcode is the ISBN barcode (using an EAN symbology) and the second barcode to the right indicates the price of the book. The first number, 5, represents a dollar sign ($). The next four numbers are the price of the book. In this exanple 51295 means that the book sells for $12.95. Since there are only 4 numbers after the 5, books that sell for more than $99.99 will be represented by 5999. The International Standard Music Number (ISMN) is a unique number for the identification of all notated music publications from all over the world, whether available for sale, hire or gratis–whether a part, a score, or an element in a multi-media kit. The ISMN is designed to rationalize the processing and handling of notated music and the respective bibliographical data for publishing houses, the music trade and libraries. ISO Standard 10957 gives the basic rules of the ISMN system. The thirteen-digit number allows a billion items each to carry a different number. The ISSN takes the form of the acronym ISSN followed by two groups of four digits, separated by a hyphen. The eighth character is a control digit calculated according to a modulo 11 algorithm on the basis of the 7 preceding digits; this eighth control character may be an “X” if the result of the computing is equal to “10”, in order to avoid any ambiguity. The ITF14 is a 14 digit barcode used to mark the master shipping containers of products with a UPC identifier. It is based on the I2of5 barcode. ITF14 barcodes usually contain a top and bottom bar (sometimes rectangle) called the Bearers bar. These bars make sure that the barcode is read completely. The first number is typically an arbitrary number between 0 and 7, the next number is a zero, the following 11 numbers are the first 11 numbers on a UPC barcode and the last number is a check digit. LOGMARS (Logistics Applications of Automated Marking and Reading Symbols) is a special application of Code 39 used by the U.S. Department of Defense and is governed by Military Standard MIL-STD-1189B. This is a special version of UCC/EAN-128, with Application Identifier (AI) = 00. It is used to identify shipping containers by a serial number. SSCC18 Barcodes can be configured 3 different ways, no bearer bars, bearer bars top and bottom or bearer bars on all 4 sides. UPC-A Barcodes are used for marking products sold in stores throughout the USA and Canada. The barcode is comprised of three groupongs of numbers, the manufacturer ID (the company who owns the barcode prefix) which is 6, 7, 8 or 9 digits in length, the balance of numbers totalling 11 digits and the final 12th number (Check Digit or Checksum). Often used for Magazines – the second barcode indicates month or edition. Often used for Greeting Cards where the publisher takes responsibility for inventory management and stocking of product. The following is a list of companies where you can purchase or download barcode fonts. Aeromium Barcode Fonts – Develops and publishes barcode fonts package that creates Code39, Code128, UPCEAN and I2of5 barcodes. Azalea Software Inc. – Publishes bar code software that creates Code 39, PDF 417, Code 128, UPC, EAN, Interleaved 2 of 5, and other barcode symbols. Bar code fonts work under Microsoft Windows, Macintosh, UNIX, and other platforms. BarFonts – Collection of PostScript Type 1 fonts for printing bar codes, available under the GNU General Public License. The fonts consist of bars only, there is no human readable text along with the bars. Barcode Writer – Open source PostScript barcode writer. BarcodeSoft Fonts – Publishes barcode fonts and MICR fonts for cheque printing. BizFonts.com – Bar code fonts including Code 39, Code 128, EAN and UPC. High density barcode fonts such as PDF417 and DataMatrix are also available. Free downloads. Carolina Barcode – Code 2 of 5 Primer and Extended Code 3 of 9 fonts for Macintosh or TrueType format. Demo available. ConnectCode Barcode Fonts – Develops and markets barcode fonts that supports the I2of5, UPCEAN, Code128, Code39 and UCCEAN barcodes. Elfring Soft Fonts, Inc. – Developer of a wide range of barcode TrueType and LaserJet fonts for use under DOS, Windows and Unix. Trial packages available for download. Free Code 39 font – Free Code 39 true type bar code font. This font supports the 43 characters of the Code 39 symbology. FreeFloat Barcode Package – Barcode package includes the following symbologies Code 39, Code 128 (UCC/EAN-128), Standard 2 of 5, Interleaved 2 of 5, and Codabar. I Shot the Serif – Free 3 of 9 – Completely free Code 39 font includes all ASCII characters. IDAutomation TrueType Fonts – An easy to use package of TrueType Barcode, MICR and OCR fonts. Kanecal – Offers symbols used in drafting/blueprint callouts. Geometric Dimensioning and Tolerancing (GD&T) symbols (with Feature Control Frames) plus Statistical Process Control (SPC) symbols. Barcodes for government shipments and Quality symbol fonts. Are UPC Barcodes the “Mark of the Beast”? Revelation 13: (17) so that they could not buy or sell unless they had the mark, which is the name of the beast or the number of its name. (18) This calls for wisdom. Let the person who has insight calculate the number of the beast, for it is the number of a man. That number is 666. Barcodes are all database driven. The barcode only represents a series of numbers containing a prefix, item numbers and a check digit. 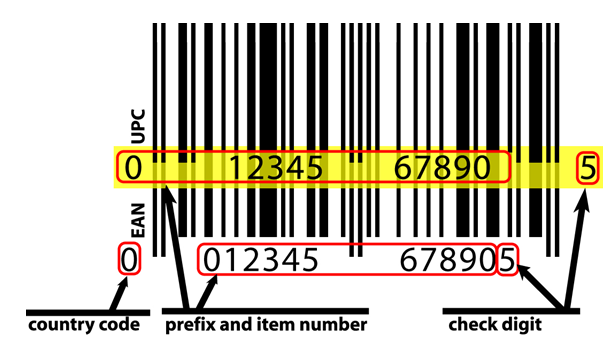 The numbers corresponding to the barcode are scanned or entered into a database exactly as indicated below the barcode (the human readable numbers). Along with the barcode number, the information relating to the product including ‘regular’ and ‘sale’ price is also entered. When an item is scanned, the information is pulled from the database and the customer is charged the proper amount of money, at the same time, inventory is adjusted downward. There are the three sets of guard bars, two bars on the far left, the far right and in the middle. Since these guard bars appear three times in a barcode, and look similar to the number 6, some people have claimed that the pattern 6-6-6 was embedded in every barcode. Barcodes are one of the things that helped bridge the gap between physical products and automated inventory tracking. Sources: http://www.laurerupc.com/ and common sense.